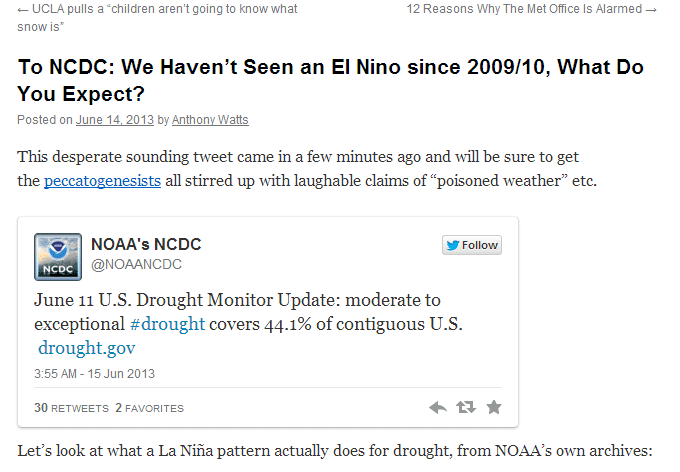 Here is yet another display of ignorance from ex-weather announcer Anthony Watts. It's also one thing to be a disinformation propagandist but it seems to me to be particularly poor taste to be so insensitive to other people's suffering. Is it an attempt to distract from the extreme weather in the USA? It's been the driest year to date on record in California and then there is the horrible fire in Colorado this week and its record-breaking hot weather. Here is a snapshot of an article from today. (Click any image to enlarge). For someone who used to earn a crust by announcing weather on television, not to mention blogging about "weather and climate" for the past six and a half years, you'd think some knowledge of weather would have rubbed off. 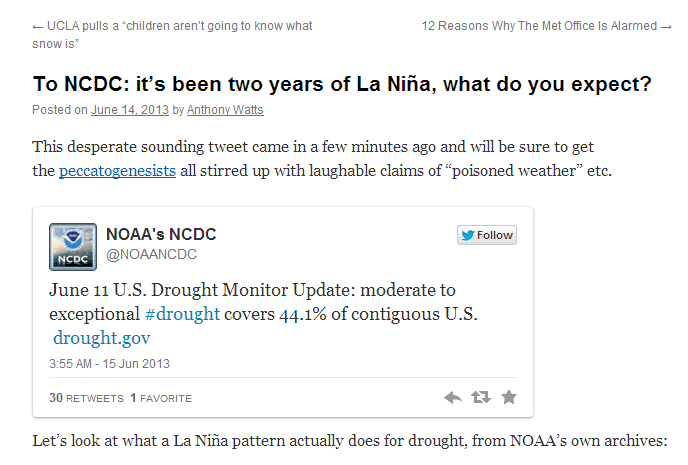 But no, Anthony says there is currently a La Niña and that it's been in place for two years. All atmospheric and oceanic indicators of ENSO have remained neutral (neither El Niño nor La Niña) since mid-2012. 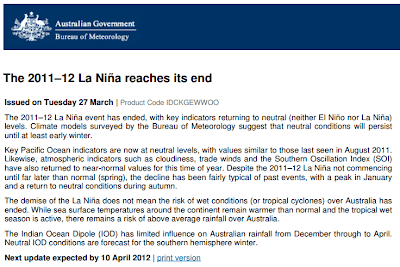 While most models suggest that neutral conditions will continue in 2013, it remains possible that a La Niña event could develop later in the year. 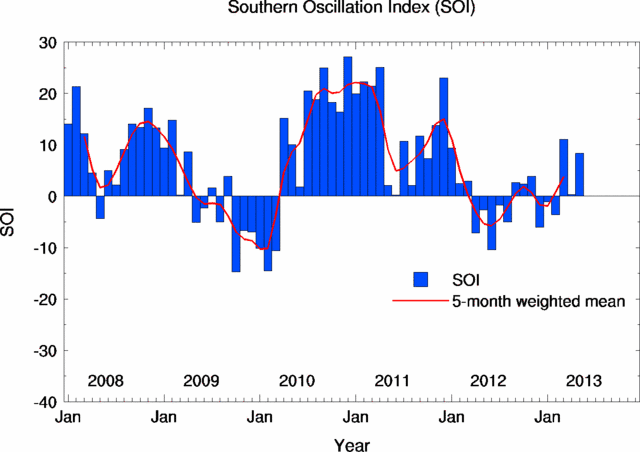 Sustained positive values of the SOI above +8 may indicate a La Niña event, while sustained negative values below −8 may indicate an El Niño event. Values of between about +8 and −8 generally indicate neutral conditions. The Southern Oscillation Index, or SOI, gives an indication of the development and intensity of El Niño or La Niña events in the Pacific Ocean. The SOI is calculated using the pressure differences between Tahiti and Darwin. ...Sustained positive values are indicative of La Niña conditions, and sustained negative values indicative of El Niño conditions. The closest it came to a La Niña was back in March this year when the SOI briefly rose about +8, but there was no suggestion that one was about to develop. 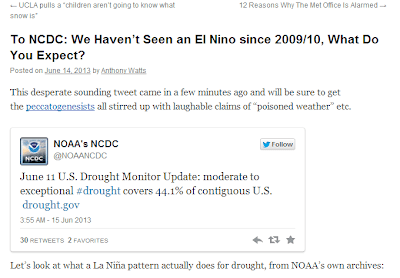 Why the persistent drought in the USA when it's ENSO neutral? The Administration is considering the relevance of climate change as it relates to drought, and the corresponding need for adaptation strategies and strategies for protecting fresh water resources. Hence, while we can provide evidence that the risk of hot and dry conditions has increased, we cannot say that the 2011 Texas drought and heat wave was "extremely unlikely" (in any absolute sense) to have occurred before this recent warming. Will extremes of weather get more extreme? The answer is obviously yes when it comes to heat and precipitation events. How will the different climate zones change over time? 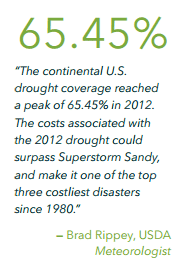 Will parts of the USA become more prone to drought or flood? Probably, is what I gather. No, Anthony - it's not "variance"
No, Anthony. Wrong again. ENSO is a sustained period, it doesn't "change from week to week" at all. June 14, 2013 at 4:17 pm I’ve changed the headline to more accurately reflect the history. So here is the new headline, but still with the comment about the "La Niña pattern" and this time trying to pin the extended drought on the absence of El Niño. Not good enough, Anthony! Is WUWT on its last legs? 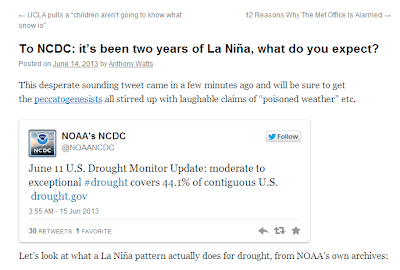 With the spate of idiotic articles lately and his reliance on nincompoops like Monckton (even promoting his nonsense to "sticky" status), and now manufacturing a La Niña as a "reason" for the continued US drought - it looks as if WUWT is on its last legs. A refuge for the 8% Dismissives. That's all. Reginald, the original headline is up top, the changed headline is down the bottom. 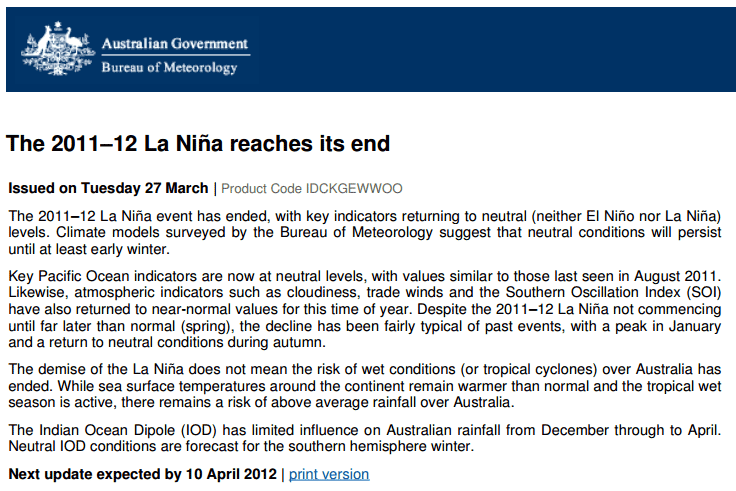 Watts has shifted from blaming it on La Nina to blaming it on an absence of El Nino! Not good enough. He should know better than that. While El Nino typically brings more rain to much of the USA, a lack of El Nino does not cause extended drought. This year there has been record wet and record dry in different parts of North America. And no ENSO event. "When the evidence is inescapable, the host man backs down while the bullsh*tter doubles-down". I doubt, however, that his blog is in danger of folding. The core group will always be there for their daily affirmation wherein the global warming hoax is exposed at breakfast, scien-terrifically crushed at lunch, and final-nailed into its coffin at dinner.